The seventeen year cicadas are emerging in the Northeast, so they’ve been in the news quite a bit of late. One video in particular is worth watching: Sam Orr’s mix of time-lapse and real time video of the complete life cycle. He has been working on this project for several years and has filmed parts of the life cycle that are seldom seen. You can read more about his work here. To learn more about where (and in what year) these creatures emerge, visit this page or this one. For those lucky enough to live where the action is, remember what you’re hearing: seventeen years of stored sunlight being released all at once as acoustic energy. The terrestrial end product of nuclear fusion exploding into your consciousness. Sewanee cicada from back in 2011: ours are on the thirteen year plan. In other words: a treat and an education for the mind and the ears. This entry was posted in Bioacoustic revelry, Cicadas and tagged cicada on May 24, 2013 by David George Haskell. This is impressive work, thanks for sharing it. We have a second home in Sautee Nacoochee, Georgia and the song of the cicadas is going strong. We are enjoying the chorus here in NC. 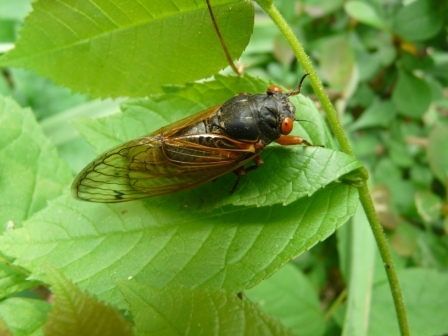 David, maybe you can help with this question: What I have found perplexing is that my neighborhood has drifts of cicada exoskeletons at the base of our trees, and cicadas are everywhere, yet where I work 20 minutes south of here, there are no cicadas. Also where Dane works 20 minutes southeast, no cicadas. Not a one in the city of Winston-Salem. Is it elevation, longitude, our older neighborhood, the abundance of trees we have? A camp I took my students to, 70 miles east of us, also had cicadas, which was heavily wooded. Why are they in some areas and not others so close by? Great video by the way, the insect world is truly amazing. Hi Ellen, Good questions! I do not know the answers but I strongly suspect that variation in soils (and soil biota — availability of food via roots, along with abundance of predators and fungal pathogens, for example) explains much of this variation. When they emerged here they were also highly patchy. Thank you for sharing the post, Arlyn. Glad to hear that The Forest Unseen is being enjoyed in Istanbul! Not a hint of a trill here in the northern Piedmont yet (outside Philadelphia). Love the book! I spend a lot of time thinking/teaching about acoustics so I enjoyed and benefited greatly from your words and thoughts — thank you for sharing them with the rest of us. I do not have the CD and would be delighted to receive a copy (735 Univ Ave, Sewanee, TN 37375). I have no CD to reciprocate with but would be honored to send my book, signed etc. I enjoyed the RadioLab show. It is SO great to hear bio-human-acoustics making inroads into our cultural space: big debt of gratitude to you for leading the way! Thanks for sharing Sam Orr’s video. I enjoyed it so much I donated to his Kickstarter campaign, and look forward to final film! Now that I know how intermittent they are, I am thrilled that we have the chorus here in Sautee Nacoochee. David, I love The Forest Unseen. I have recommended it to dozens of people and I have learned to take my time in observing the Georgia Appalachian forest I am lucky enough to spend time in. One of favorite passages is when you describe the sound of a tree falling in the forest. Question: what do the cicadas eat? Thank you — I’m very happy to hear that you’ve enjoyed The Forest Unseen, especially the acoustics of woodlands. The young cicadas eat sap from tree roots. The adults also feed on sap, using piercing mouthparts to access the food.